Horror Films 101: “When love goes terribly wrong” moments in horror cinema. Scene from the Thai film “Shutter” (2004). 1. Asian ghosts always have an agenda. Typically, it’s one motivated by a desire for revenge, or a need for justice. In the Thai supernatural-thriller Shutter (2004, directed by Banjong Pisanthanakun and Parkpoom Wongpoom), the heroine Jane mistakenly believes that the female ghost who torments both she and her boyfriend Tun is seeking revenge for the hit-and-run accident in which the mysterious woman was killed. There’s much more to the story, however, as a dark secret connecting Tun to the dead woman is ultimately revealed. The true horror of this film may be the fact that, even though Tun’s deeply troubling past has been shown, Jane seems to be supportive of him at the finale — so much for justice and gender equality in Thailand. I thoroughly enjoyed this Thai ghost story and, even though an English-language remake was released in 2008, I feel no need to watch it. I can read subtitles just fine, thanks. Unrequited love gone wrong in “Haute Tension” (2003). 2. Haute Tension (2003). If a woman wielding a bloody chainsaw towers above you, shouting “Do you love me? !” over the ear-splitting whirl of the blade, I would just quickly say “YES!”. If you don’t happen to share her amorous feelings, you can explain so later at a safe distance. Preferably over the phone, from another continent. May admires her Frankenstein-like creation. 3. The desperate ache of loneliness never seemed so palpable as it does in Lucky McKee’s May (2002). When our titular heroine, a socially-awkward misfit whose best friend is a (very creepy) doll, fails to find her true love, she takes matters into her own hands and fashions herself one. 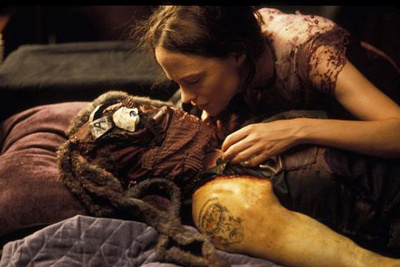 Angela Bettis, a long-time acting staple in McKee’s films, turns in a surprisingly sympathetic portrayal of a character who’s essentially a psychotic serial killer. A criminally neglected film. 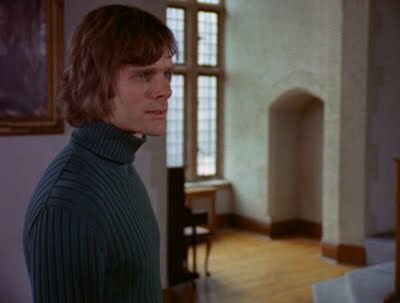 Keir Dullea, all turtlenecks and shaggy 1970’s hair, as Peter in “Black Christmas” (1974). 4. You know a relationship’s going south when you begin to suspect your lover of being a serial killer. Such was the case between Jess and her turtleneck-wearing boyfriend Peter in Black Christmas (1974). When Jess reveals to Peter her unwanted pregnancy and plans to have an abortion, his reaction is not only negative, but downright crazy in its intensity. But did this news, plus his failed piano recital — artists, they’re so sensitive — push Peter to the brink of insanity?